The lovely Dina Meyer stars opposite Danny Trejo in “Dead in Tombstone” and Bullz-Eye.com was on location for the filming of the movie in Romania. Dina discusses how she loves playing strong women and working with Danny Trejo. Check out the interview. Bullz-Eye.com was on location in Romania for the filming of “Dead in Tombstone” and we had the opportunity to interview the incomparable star Danny Trejo again as you can see below. We had recently spoken with him on the set of “Death Race 3” and this time he had the lead role in the film. 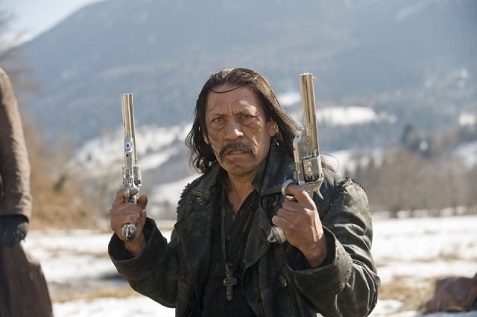 You can’t go wrong with Trejo carrying an action film, and he clearly relishes playing this badass role, explaining how he makes a deal with the devil (Mickey Rourke) and bragging that it’s the only movie where he dies twice. He describes this movie as a “Horror Western” with a large body count. The movie is directed by Roel Reiné who also directed “Death Race 3” and is making quite a name for himself with his action sequences. Check back as we also interviewed his lovely costar Dina Meyer. It was fascinating to see a Western filmed live. Putting together action scenes involving horses involves a great deal of coordination. Check out “Dead in Tombstone” on Blu-ray/DVD if you’re looking for an action fix.